Direct velocity measurement: TSI’s precision measurement of face velocity, the important safety parameter, provides the basis for a simple closed-loop control system. If the velocity drops, alarms warn users of unsafe conditions. Thousands of researchers rely on TSI products to provide safety each and every day. 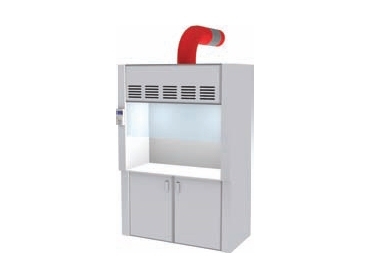 Complete configuration: Regardless of your preference of fume hood control method, TSI’s FHC50 Fume Hood Controllers provide the ability to completely configure the product in the field. Alarm options, display configurations, I/O alternatives, and network communications are all part of the offering. Field configuration: A trained TSI technician makes it easy to configure the FHC50 Fume Hood Controllers for specific applications. Sash position control: Using sash sensors to monitor sash position provides some unique opportunities to enhance fume hood control, including sash management and fast speed of response when sashes are moved. Best of both words: By applying both a precision side-wall velocity sensor and a sash sensor, you are able to achieve the fastest response possible with the enhanced safety of measuring (and alarming on) the critical safety parameter of face velocity.